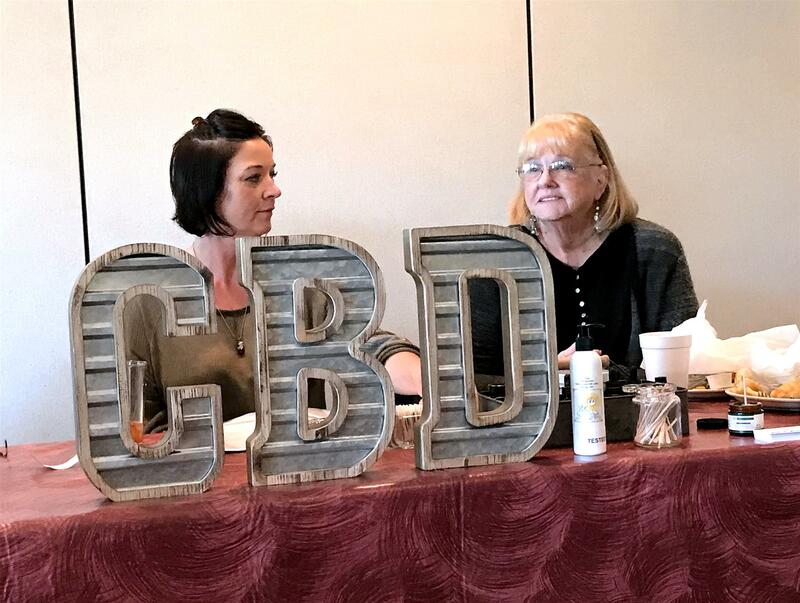 Amy O'Bannon, left, and Dorothy Clark told Mineral Wells Rotarians Wednesday about their CBD – cannabidiol – products that, when used, won't make you "stoned" but could help reduce or completely relieve a variety of medical ailments or issues. They explained their Colorado-manufactured products – soft gels, lotions, salves, capsules, edibles and flavored tinctures – are legal in Texas without a prescription because, while they are made from hemp, they contain 0 percent THC, the active ingredient in marijuana. They can make no specific claims about the medicinal qualities or relief provided by their CBD products, so they let their customers speak for them. They had read aloud a letter from one client who spoke of the relief given their daughter who suffered severely from epileptic seizures and migraines but is now living a healthier and happier life thanks to CBD products. One Rotarian gave a personal testimonial of a family member who in just their early 40s went from an active lifestyle to one of barely able to physically move. But using CBD products – for him in higher doses – has enabled him to once again become active and enjoy outings with family members. Clark said there are products for pets and even livestock. She said she became a believer in CBD when she provided her dog, dying and in pain from cancer, a product she said eased its pain and allowed it to live its final days comfortably. There are some disclaimers for those using or wanting to use CBD products, and Clark said people using doctor-prescribed medications for the treatment of ailments and conditions should continue to do so and consult with their physician before using CBD. O'Bannon and Clark sell the At Ease product lines that tout themselves as pure, all natural and organic. At Ease uses a proprietary extraction process that removes any and all THC content and made in accordance with the U.S Farm Bill standards and regulations. At Ease says their CBD products can help ease pain or complications for a number of medical and physiological conditions including ADD/ADHD, Alzheimer's, cancer, PTSD, sleep disorders, anxiety, Parkinson's, osteoporosis, migraines, skin conditions, fibromyalgia, epilepsy and seizures, and more. There are CBD products that do contain levels of THC and are not legal to buy online or over the counter in Texas. For more information, go to www.cbdhempforsale.com or visit O'Bannon or Clark at the local Farmer's Market or The Market at 76067 downtown where they sell their At Ease product lines. They are also available at 940 Vapes downtown and will be sold in O'Bannon's soon-to-be-built store on East Hubbard Street at Pasadena Boulevard. You can also contact O'Bannon at 940-445-0418. 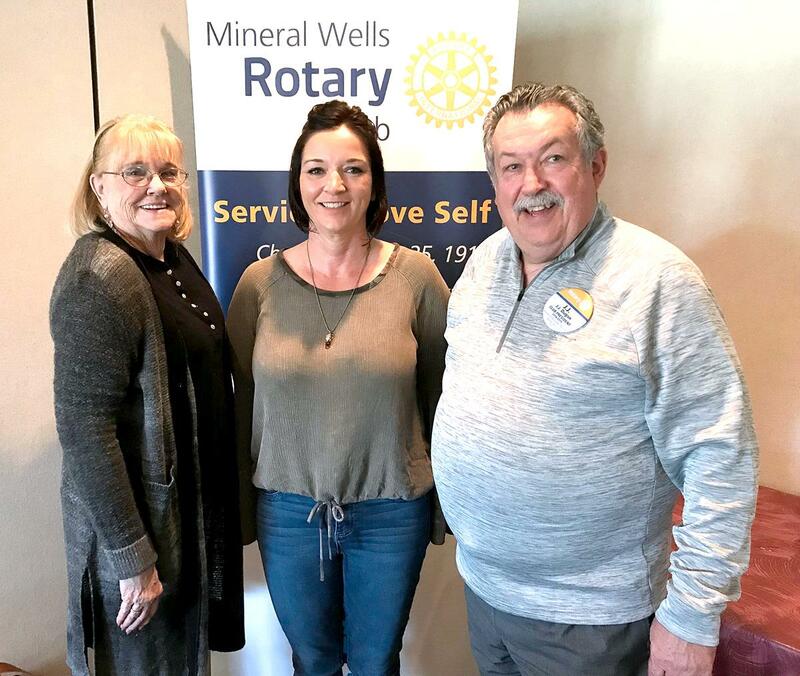 Rotary Club of Mineral Wells meets every Wednesday at noon at Holiday Hills Country Club for lunch, networking, updates on club events and a program of interest. The club will not meet Nov. 21, Dec. 19 or Dec. 26 because of the Thanksgiving and Christmas holidays.